What is the “technical” name for dog zoomies? If you answered A, Attention Deficit Hyperactivity Disorder (ADHD), the answer is incorrect. According to Pat Miller, dogs with ADHD tend to display frenetic activity, but they have a hard time focusing due to abnormally short attention spans and they’re highly impulsive. This condition is greatly overdiagnosed and for the most part dogs who are acting “hyper” are just perfectly normal high-energy dogs. True hyperactivity in dogs is “a rare clinical syndrome, explains Debra F. Horwitz, veterinarian and Diplomate of the American College of Veterinary Behavior. If you answered B, Dog Hyperkinesis, consider that this is just another term used to depict dogs who are hyperactive and cannot seem to rest even in calm, quiet surroundings. If you answered C, Obsessive compulsive disorder (OCD) this answer is also incorrect–unless your dog is running in circles or chasing his tail for the most part of the day. Dogs with OCD will engage in repetitive behavior, such as chasing shadows, sucking their blankets, chasing tails, or licking paws, explains Jill Goldman, an applied animal behaviorist based in southern California. So the correct answer is D, Frenetic Random Activity Period, often abbreviated as FRAP. Also known as Frenetic Random Activity Period (FRAP), dog zoomies are quite popular in puppies and young dogs, but they are also seen in older dogs every now and then. Affected dogs will get a crazy look on their faces as they take a play bow and then start wildly romping up and down the hallway or from one side of the room to another. Why do dogs get the zoomies in the first place? It varies from dog to dog. Some dogs may get a case of zoomies after being restrained for some time such as when being groomed or bathed. Dogs act crazy after a bath also perhaps as a way to speed up the drying process. You may sometimes see the zoomies in dogs engaged in doggy sports as a way to release their stress and in puppies it may be a sign that the puppy is getting tired and cranky, frustrated or overstimulated. 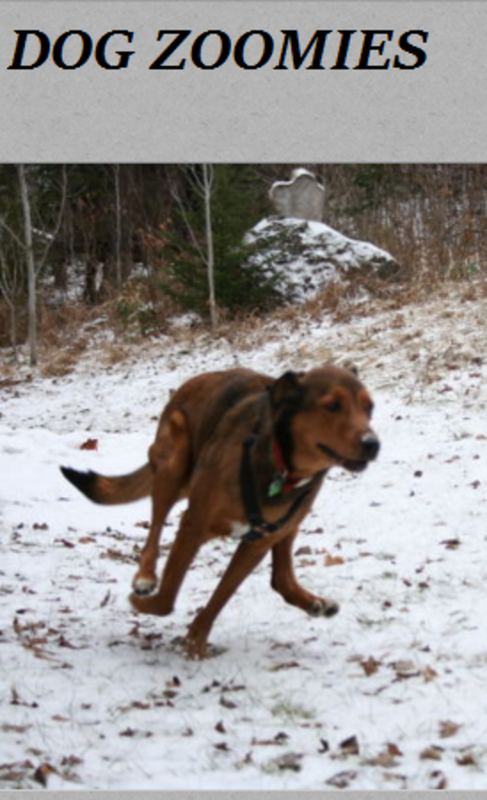 For some dogs though the zoomies are just a way of celebrating life. Some dogs get the zoomies after eating as if they were celebrating the sensation of having a full stomach and some dogs get them when their owners come home as if to celebrate the end of feeling lonely or bored. Some other dogs find that it’s a nice way to start the day after sleeping all night. And then there are dogs who act crazy after pooping as if they had to celebrate the relief of emptying their bowels or perhaps their wild running is just a way of ensuring that “no particles” are being left behind! Last but not least, there are dogs who get the zoomies when they’re tired or frustrated, just like toddlers throwing tantrums when they’re cranky and it’s time to go to sleep. What should you do if your dog has the zoomies? When your dog acts crazy due to those Frenetic Random Activity Periods, you may be concerned about him hurting himself or knocking down your vases or porcelain collection off a coffee table. One option is to rush towards the door to entice your dog to chase you and let him take the steam off in the yard. With more space, there are less chances of him causing trouble and you can wait it out. Alternatively, you can try focusing his attention on some toy and encourage him to play a calmer game of tug or a fetch. A helpful way to teach your dog how to turn off his “hyper switch” is by teaching a fun game such as Ian Dunbar’s “Jazz up and Settle Down” game. You can prevent the zoomies from occurring in the first place by evaluating when they seem to occur the most and taking action. For example, if you know your dog has the zoomies after meals, prevent them by engaging your dog in a training session or in a mentally stimulating game using interactive toys before he starts running around acting crazy. Remember that the zoomies are often fueled by excess energy so if you engage your puppy or dog in several activities during the day, they are less likely to occur. For many dog owners, the zoomies are simply an entertaining activity that’s worthy of sitting back and watching the show.